Baron Carl Gustaf Emil Mannerheim (4 June 1867 - 27 January 1951) was the Commander-in-Chief of Finland's Defence Forces during World War II, Marshal of Finland and a politician. He was Regent of Finland (1918-1919) and the sixth President of Finland (1944-1946). Mannerheim was born in the Grand Principality of Finland, a territory of Imperial Russia, into a family of Swedish-speaking nobles settled in Finland since the late 18th century. His paternal German ancestor Marhein had emigrated to Sweden during the 17th century. His maternal ancestry has its roots in Sodermanland, Sweden. He made a career in the Russian army, rising to general. He also had a prominent place in the ceremonies for Tsar Nicholas II's coronation and later had several private meetings with the Russian Tsar. After the Bolshevik revolution, Finland declared its independence but was soon embroiled in a civil war along class lines. The workers overwhelmingly held a socialist ("Red") creed; whereas the bourgeois, farmers, and businessmen held a capitalist ("White") creed. Mannerheim was appointed to be the military chief of the Whites. Twenty years later, when Finland was at war with the Soviet Union from 1939-1944, Mannerheim was appointed commander of the country's armed forces. The Mannerheim family descends from a German businessman and mill owner from Hamburg, Hinrich Marhein (1618-1667), who emigrated to Gx�vle in Sweden and changed his name to Henrik. His son Augustin Marhein changed his surname to Mannerheim, and was raised to the nobility in 1693. His son, an artillery colonel and a mill supervisor, Johan Augustin Mannerheim, was raised to the status of Baron at the same time as his brother in 1768. The Mannerheim family came to Finland, then an integral part of Sweden, in the latter part of 18th century. (It was long believed that Hinrich Marhein had emigrated to Sweden from the Netherlands, but recent studies have shown this belief to be erroneous). Mannerheim was also of Scottish ancestry on his paternal side, his ancestor George Wright (the founder of the Von Wright line of Finnish nobility) having emigrated from Dundee to Sweden in the 17th century. Mannerheim's great-grandfather, Count Carl Erik Mannerheim (1759-1837), had held a number of offices in Finland's civil service during the early years of the autonomous Russian Grand Principality of Finland, including membership in the Senate. In 1825, he was promoted to the rank of Count (in Finnish Kreivi, in Swedish Greve). Mannerheim's grandfather, Count Carl Gustaf Mannerheim (1797-1854), was a renowned entomologist, and served as President of the Viipuri Court of Appeals. Mannerheim's grandmother Countess Eva Wilhelmina Mannerheim n�e Schantz was one of the leading figures in Finnish society. Mannerheim's father, Carl Robert, Count Mannerheim (1835-1914) was a playwright who held liberal and radical political ideas, but was an unsuccessful businessman. Mannerheim's mother, Hedvig Charlotta Helena (H�lx�ne) von Julin (1842-1881), was the daughter of the wealthy industrialist Johan Jacob von Julin, who owned the Fiskars ironworks and village. Carl Gustaf Mannerheim was born in the family home of Louhisaari Manor in Askainen. As the third child of the family he inherited the title of Baron (in Finnish Vapaaherra, in Swedish Friherre; only the eldest son would inherit the title of Count). Despite his businesses, his father ran into difficulties in the late 1870s. He suffered from a hypomania personality disorder, which manifested itself in his being overly optimistic in financial dealings. His addiction to gambling worsened the situation and he went bankrupt in 1880. He was forced to sell Louhisaari manor and other landed estates along with his large art collection to cover his debts. He left his wife and moved to Paris with his mistress, becoming a bohemian. Countess H�lx�ne, shaken by the bankruptcy and her husband's desertion, took their seven children to live with her aunt Louise at this aunt's estate in Sx�llvik. H�lx�ne died the following year from a heart attack, caused by her shame and depression. Her death left the children to be brought up by relatives, making Gustaf Mannerheim's maternal uncle Albert von Julin his legal guardian. Due to the worsened family finances and Gustaf Mannerheim's serious discipline problems in school, Albert von Julin decided to send him to the school of the Finnish Cadet Corps in Hamina in 1882 to learn self-discipline (something he excelled in as an adult) and a profession. Besides his mother tongue, Swedish, Mannerheim would learn to speak Finnish, Russian, French, German and English. However, due to his service in the Russian armed forces from 1887 to 1917, Mannerheim forgot most of the Finnish he had learned in his childhood, and would have to learn the language again in later life. He also spoke Polish, Portuguese and understood some Mandarin Chinese. In his youth, Gustaf Mannerheim also had to learn how to budget and economize, due to his family's worsened financial status. He was humiliated by having to ask his uncle Albert for money for every small purchase. He was also forced to read his uncle's and other relatives' numerous exhortations to frugality and good conduct. The disciplinary problems continued. Mannerheim heartily disliked the school and the narrow social circles in Hamina. In the end, he rebelled by going on leave without permission in 1886, - for which he was expelled from the Finnish Cadet Corps. As a military career in the Finnish army was closed to Gustaf, the only choice left was a career in the Russian armed forces. Young Gustaf was not averse to this idea. His first choice had been, while still in the Finnish Cadet Corps, to enter the Imperial Page School in St Petersburg. But his report from the Finnish Cadet Corps, with his bad conduct at school, made this impossible. After spending some time with Albert von Julin's brother-in-law, Edvard Bergenheim, at Kharkov, in modern Ukraine - where he received lessons in Russian - Mannerheim attended the Helsinki Private Lyceum, passing his university entrance examinations in June 1887. Now he had a better school report to show than the one from the Finnish Cadet Corps. He wrote to his godmother, Baroness Alfhild Scalon de Coligny, who had connections at the Russian court, to help him enter the Nicholas Cavalry School. His real wish was to join the Chevalier Guard, but his relatives balked at the costs, so he dropped it. His godmother invited him to her husband's country house, Lukianovka, in the summer of 1887. There Gustaf worked to improve his Russian. While in Russia, he spent some time at a military camp at Chuguyev, which strengthened his decision to choose a career in the military. At the end of July 1887, Gustaf was informed that he could take the entrance examination of the Nicolas Cavalry School in St. Petersburg. He passed it and swore his soldier's oath to the Tsar of Russia on 16 September 1887. He graduated in 1889 tenth in his class after having fallen from second after a drunken argument about Finnish autonomy with a superior officer.He swore to never drink to excess again.. Mannerheim was commissioned as a Cornet. He was posted to the 15th Alexandriyski Dragoons at Kalisz on the German border. 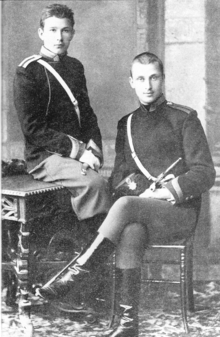 Picture - Mannerheim (right) with a fellow student, Antanas Ričardas Druvė in Nicholas Cavalry School, St Petersburg, late 19th century. In January 1891, Mannerheim was transferred to Her Majesty's Maria Feodorovna's Chevalier Guard in St Petersburg - a position in which his height (he stood at 187 cm (6' 1�")) was an advantage, and one which also led to his being given a prominent place in the ceremonies for Tsar Nicholas II's coronation in 1896. In 1892, Mannerheim's godmother, Countess Alfhild Scalon de Coligny, arranged for him to be married to wealthy and beautiful noble lady of Russian-Serbian heritage Anastasia Arapova (1872-1936), the orphaned daughter of Major-General Nikolai Arapov. They had two daughters, Anastasie (1893-1978) and Sophie (1895-1963); a third child, a son, was stillborn. Anastasie would later convert to Catholicism and become a Carmelite nun in England. Mannerheim separated from Anastasia Arapova in 1902 and they were divorced in 1919. Mannerheim served in the Imperial Chevalier Guard until 1904, though he was posted to the Imperial Court Stables Administration from 1897 to 1903. Mannerheim specialised as an expert on horses, buying stud stallions and special duty horses for the army. In 1903, he was put in charge of a display squadron and became a member of the equestrian training board of the cavalry regiments. After the separation from his wife, Gustaf Mannerheim's financial situation became bleak. This was exacerbated by gambling losses. He became depressed, which he tried to solve through a change of environment. Mannerheim volunteered for duty in the Russo-Japanese war in 1904. In October 1904, he was transferred to the 52nd Nezhin Dragoon Regiment in Manchuria, with the rank of Lieutenant-Colonel. He was promoted to Colonel for his bravery in the Battle of Mukden in 1905. On returning from the war, Mannerheim went on an informal vacation among his relatives in Finland and Sweden 1905-1906. As one of the baronial branch of his family, he was a member of the Estate of Nobility in the last session of the Diet of Finland. When he returned to St. Petersburg, he was asked if he would like to make a journey through Turkestan to Beijing as a secret intelligence-officer. General Palitsyn, Chief of the Russian General Staff, wanted accurate, on-the-ground intelligence about the reform and modernization of the Qing Dynasty. The Russians wanted to know the military feasibility of invading Western China, including the provinces of Xinjiang and Gansu, in its struggles with Britain for control of Inner Asia known as "The Great Game." After much deliberation, Mannerheim, disguised as an ethnographic collector, joined the French archeologist Paul Pelliot's expedition in Samarkand in Russian Turkestan (now Uzbekistan). 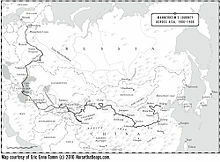 From the terminus of the Trans-Caspian Railway in Andijan, the expedition started in July 1906, but Mannerheim spent the greater part of it alone, after having a falling out with Pelliot on their way to Kashgar in China's Xinjiang province. Picture - Gustaf Mannerheim's route across Asia from St. Petersburg to Peking, 1906-08. With a small caravan, including a Cossack guide, Chinese interpreter and Uyghur cook, Mannerheim first trekked to Khotan in search of British and Japanese spies. Upon returning to Kashgar, he headed north into the Tian Shan range, surveying passes and gauging the attitudes of Kalmyk, Kazakh and Kyrgyz tribes towards the Han Chinese. He arrived in the provincial capital of Urumqi, and then headed east to Turpan, Hami and Dunhuang in Gansu province. 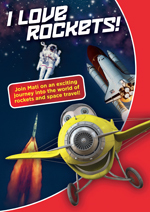 He followed the Great Wall of China through the Hexi Corridor, and investigated a mysterious tribe known as Yugurs. From Lanzhou, the provincial capital, he headed south into Tibetan territory and the lamasery of Labrang, where he was stoned by xenophobic monks. He eventually made it to Xi'an, Zhengzhou and Kaifeng in Central China. At Zhengzhou, he took a train to Taiyuan, the capital of Shanxi province, and then trekked to the sacred Buddhist mountain of Wutai Shan, where he met the Dalai Lama, who was launching a nascent campaign to free Tibet from Chinese Imperial rule. Mannerheim gave the Tibetan pontiff his own pistol as a gift and for protection against the Chinese. Mannerheim then headed north beyond the Great Wall into steppe traditionally occupied by Mongol herders. He arrived in Hohhot, the capital of Inner Mongolia, and found the Mongols in a rebellious mood because of a corrupt military Governor who was colonizing Mongol pasture lands with Han Chinese farmers. Mannerheim eventually arrived in Beijing in July 1908, where he worked on his military intelligence report. He returned to St. Petersburg via Japan and the Trans-Siberian Express. His military report was a detailed account of modernization in the late Qing Dynasty, covering education, military reforms, Han colonization of ethnic borderlands, mining and industry, railway construction, the influence of Japan and opium smoking. After his return in 1909, he was appointed to command the 13th Vladimir Uhlan Regiment at Mińsk Mazowiecki in Poland. 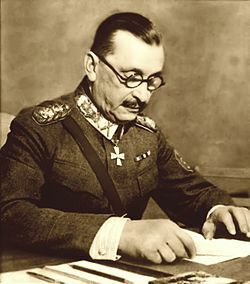 The following year, Mannerheim was promoted to Major General and was posted as the commander of the Life Guard Uhlan Regiment of His Majesty in Warsaw. In 1912, he became a part of the Imperial entourage, and the following year he was appointed as a cavalry brigade commander. At the beginning of World War I, Mannerheim served as commander of the Guards Cavalry Brigade, and fought on the Austro-Hungarian and Romanian fronts. After distinguishing himself in combat against the Austro-Hungarian forces, Mannerheim was in December 1914 awarded the Order of St. George, 4th class. He said that after receiving this award, "now he can die in peace". In March 1915, Mannerheim was appointed to command the 12th Cavalry Division. He received leave to visit Finland and St. Petersburg in early 1917, and witnessed the outbreak of the February Revolution. After returning to the front, he was promoted to Lieutenant General in April 1917 (the promotion was backdated to February 1915), and took command of the 6th Cavalry Corps in the summer of 1917. However, Mannerheim fell out of favour with the new government, who regarded him as not supporting the revolution. Indeed, Mannerheim became a determined opponent of communism. In September he was relieved of his duties, while on sick-leave after having fallen from his horse. He was now in the reserve and trying to recover his health in Odessa. He decided to retire and return to Finland, where he went that December. Picture - Mannerheim leading the victory parade at the end of the Finnish Civil War in Helsinki, 1918. In January 1918, the Senate of the newly independent Finland, under Pehr Evind Svinhufvud, appointed Mannerheim as Commander-in-Chief of Finland's almost nonexistent army, which was then not much more than some locally set up White Guards. His mission was to defend the Government and its forces during the Civil War (or War of Liberty, as it was known among the "Whites") that broke out in Finland. The Civil War was inspired by the October Revolution in Russia. He accepted the position despite misgivings about the pro-German stance of the government. He established his headquarters in Vaasa and began to disarm the Russian garrisons and their 42,500 men. During the Civil War, Mannerheim was promoted to General of Cavalry (Ratsuvx�enkenraali) in March 1918. 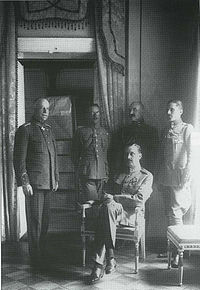 Picture - Mannerheim as Regent (seated), with his adjutants (left) Lt. Col. Lilius, Capt. Kekoni, Lt. Gallen-Kallela, Ensign Rosenbrx�ijer. After the victory of the Whites, Mannerheim resigned as Commander-in-Chief. He feared the reaction of the Allies to the pro-German policies of the Finnish government during the last months of World War I. Seeking to distance himself from the government, Mannerheim left Finland in June 1918 to visit relatives in Sweden. In Sweden, Mannerheim conferred with Allied diplomats in Stockholm, stating his opposition to the Finnish government's pro-German policy, and his support for the Allies. In October 1918, he was sent to Britain and France, on behalf of the Finnish government, to attempt to gain recognition of Finland's independence by Britain and the United States. In December, he was summoned back to Finland from Paris after he had been elected temporary Regent (Valtionhoitaja; Riksfx�restx�ndare) of Finland. There were even monarchists who wanted to make him King of Finland. As Regent, Mannerheim often signed official documents using Kustaa, the Finnish form of his Christian name, in an attempt to emphasise his Finnishness to some sections of the Finnish population who were suspicious of his background in the Russian armed forces. Mannerheim disliked his last Christian name - Emil - and wrote his signature as C. G. Mannerheim, or simply Mannerheim. Among his relatives and close friends he was called Gustaf. After King Frederick Charles of Hesse renounced the throne, Mannerheim secured recognition of Finnish independence from Britain and the United States. He also requested and received food aid to avoid famine. Although he was an ardent anti-Bolshevik, he refused an alliance with the Russian White generals and their armies, because they probably would not have accepted the independence of Finland. In July 1919, after he had confirmed a new republican constitution, Mannerheim stood as a candidate in the first presidential election, supported by the National Coalition Party and the Swedish People's Party. He lost the election in the Parliament to Kaarlo Juho Stx�hlberg and left public life. In the interwar years, Mannerheim held no public office. This was largely due to his being seen by many politicians of the centre and left as a controversial figure for his outspoken opposition to the Bolsheviks, his supposed desire for Finnish intervention on the side of the Whites during the Russian Civil War, and the antipathy of Finnish socialists, who saw him as the 'bourgeois' 'White General'. Mannerheim also doubted that the modern party-based politics would produce principled and high-quality leaders in Finland or elsewhere. In his gloomy opinion, the fatherland's interests were too often sacrificed by the democratic politicians for partisan benefit. During the interwar years, Mannerheim's pursuits were mainly humanitarian. He headed the Finnish Red Cross and founded the Mannerheim League for Child Welfare. In the 1920s and 1930s, Mannerheim returned to Asia, where he travelled and hunted extensively. On his first trip in 1927, to avoid going through the Soviet Union, he went by ship from London to Calcutta. From there he travelled overland to Burma, where he spent a month at Rangoon, then he went on to Gangtok, in Sikkim. He returned home by car and aeroplane, through Basra, Baghdad, Cairo, and Venice. His second voyage, in 1936, was to India, by ship via Aden to Bombay. During his stay in India, Mannerheim met old friends and acquaintances from Europe. During his travels and hunting expeditions, he visited Madras, Delhi and Nepal. While in Nepal, Mannerheim was invited to join a tiger hunt by the King of Nepal. He killed a 3.23 m long tiger which had reputedly killed two men. The pelt is on display at the Mannerheim Museum in Kaivopuisto, Helsinki. In 1929, Mannerheim refused the right-wing radicals' plea to become a de facto military dictator, although he did express some support for the right-wing Lapua Movement (Screen, 2000). After President Pehr Evind Svinhufvud was elected in 1931, he appointed Mannerheim as chairman of Finland's Defence Council. At the same time, Mannerheim received a written promise that in the event of war, he would become the Commander-in-Chief of the Finnish Army. (Svinhufvud's successor Kyx�sti Kallio renewed this promise in 1937). In 1933, he received the rank of Field Marshal (sotamarsalkka, fx�ltmarskalk). By this time, Mannerheim had become seen by the public, including some former socialists, as less of a 'White General', and more of a national figure. This feeling was enhanced by his public statements urging reconciliation between the opposing sides in the Civil War and the need to focus on national unity and defence. Mannerheim supported Finland's military industry and sought (in vain) to establish a military defence union with Sweden. However, rearming the Finnish army did not occur as swiftly or as well as he hoped and he was not enthusiastic about a war. He had many disagreements with various Cabinets, and signed many letters of resignation. (See, for example, Martti Turtola, "Risto Ryti: A Life for the Fatherland" / Risto Ryti: Elx�mx� isx�nmaan puolesta). When negotiations with the Soviet Union failed in 1939, Mannerheim on 17 October withdrew his resignation. At the age of 72, he became Commander-in-Chief of the Finnish army after the Soviet attack on 30 November. In a letter to his daughter Sophie, he stated that "I had not wanted to undertake the responsibility of commander-in-chief, as my age and my health entitled me, but I had to yield to appeals from the President of the Republic and the government, and now for the fourth time I am at war." The President of the Republic has appointed me on 30 November 1939 as Commander-in-Chief of the armed forces of the country. Brave soldiers of Finland! I enter on this task at a time when our hereditary enemy is once again attacking our country. Confidence in one's commander is the first condition for success. You know me and I know you and know that everyone in the ranks is ready to do his duty even to death. This war is nothing other than the continuation and final act of our War of Independence. We are fighting for our homes, our faith, and our country. Mannerheim quickly organised his headquarters in Mikkeli. His chief of staff was Lieutenant General Aksel Airo, while his close friend, General Rudolf Walden, was sent as a representative of the headquarters to the Cabinet from 3 December 1939 until 27 March 1940, after which he became Defence Minister. Mannerheim spent most of the Winter War and Continuation War in his Mikkeli headquarters but made many visits to the front. Between the wars, he remained Commander-in-Chief, which strictly should have returned to the presidents (Kyx�sti Kallio and Risto Ryti) after the Moscow Peace, on 12 March 1940. Before the Continuation War, the Germans offered Mannerheim command over German troops in Finland, around 80,000 men. Mannerheim declined so as to not tie himself and Finland to Nazi war aims. Mannerheim kept relations with Adolf Hitler's government as formal as possible and successfully opposed proposals for an alliance. If Mannerheim had not also firmly refused to let his troops participate in the Siege of Leningrad, they would have ended up becoming an integral part of said siege. Mannerheim's 75th birthday, on 4 June 1942, was a major occasion. The government granted him the unique title of Marshal of Finland (Suomen Marsalkka in Finnish, Marskalk av Finland in Swedish). So far he has been the only person to receive the title. A surprise visit by Hitler in honour of Mannerheim's birthday was less pleasing to him and caused some embarrassment. Picture - Discussion with Hitler, Mannerheim and president Ryti. Hitler visited in Mannerheim's 75-year birthday. Adolf Hitler decided to visit Finland on 4 June 1942, ostensibly to congratulate Mannerheim on his 75th birthday. But Mannerheim did not want to meet him in his headquarters in Mikkeli or in Helsinki, as it would have seemed like an official state visit. The meeting took place near Imatra, in south-eastern Finland, and was arranged in secrecy. From Immola Airfield, Hitler, accompanied by President Ryti, was driven to the place where Mannerheim was waiting at a railway siding. After a speech from Hitler, and following a birthday meal and negotiations between him and Mannerheim, Hitler returned to Germany. President Ryti and other high-ranking Finns and Germans were also present. Hitler spent about five hours in Finland. Hitler reportedly intended to ask the Finns to step up military operations against the Soviets, but he apparently made no specific demands. During the visit, an engineer of the Finnish broadcasting company YLE, Thor Damen, succeeded in recording the first 11 minutes of Hitler's and Mannerheim's private conversation. This had to be done secretly, as Hitler never allowed others to record him off-guard. Damen was given the assignment to record the official birthday speeches and Mannerheim's responses and following those orders added microphones to certain railway cars. Unfortunately, Mannerheim and his guests chose to go to a car that didn't have a microphone in it. Damen acted quickly, pushing a microphone through one of the car windows to a netshelf just above were Hitler and Mannerheim were sitting. After 11 minutes of Hitler's and Mannerheim's private conversation, Hitler's SS bodyguards spotted the cords coming out of the window and realized that the Finnish engineer was recording the conversation. They gestured to him to stop recording immediately, and he complied. The SS bodyguards demanded that the tape be immediately destroyed, but YLE was allowed to keep the reel, after promising to keep it in a sealed container. It was given to the head of the state censors' office Kustaa Vilkuna and in 1957 returned to YLE. 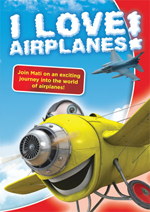 It was made available to the public a few years later. It is the only known recording of Hitler speaking in an unofficial tone. There is an unsubstantiated story that during his meeting with Hitler, Mannerheim lit a cigar. Mannerheim supposed that Hitler would ask Finland for help against the Soviet Union, which Mannerheim was unwilling to give. When Mannerheim lit up, all in attendance gasped, for Hitler's aversion to smoking was well known. Yet Hitler continued the conversation calmly, with no comment. In this way, Mannerheim could judge if Hitler was speaking from a position of strength or weakness. He was able to refuse Hitler, knowing that Hitler was in a weak position, and could not dictate to him. Mannerheim's wartime record as the Finnish Commander-in-Chief is not easy to assess. Even to this day, Mannerheim's immense prestige made criticism of his conduct of war almost tantamount to treason (especially as the criticism often came from Soviet sources and Finnish communists). It is perhaps easiest to divide Mannerheim's role in two: Mannerheim the military commander and Mannerheim the politician. As a military commander Mannerheim was generally successful. Under his leadership the Finnish Defence Forces saved Finland from Soviet occupation. Mannerheim took care not to waste the lives of his soldiers, and avoided unnecessary risks. Perhaps his greatest shortcoming was his unwillingness to delegate. While he had a number of able subordinates, such as Lieutenant General Aksel Airo, Mannerheim insisted that all the department heads in the Finnish General Headquarters should report directly to him, leaving his Chief of General Staff General of Infantry Erik Heinrichs little to do. Mannerheim overwhelmed himself with work, and as a result coordination between the different departments in the General Headquarters suffered. It has been suggested that one reason why the Soviet offensive in Karelian Isthmus in June 1944 took the Finns by surprise was that Mannerheim was unable to see the forest for the trees. There was no other authority save Mannerheim to collect the intelligence and turn it into operational orders. There were some tensions between Mannerheim and the other prominent Finnish leaders during the Winter and Continuation Wars. President Ryti at least once criticized Mannerheim for acting so as to retain as good historical reputation as possible. Prime Minister Linkomies in his posthumous memoirs criticized him for mood swings and capricious behaviour, which at times resembled that of famous artists. Prime Minister Paasikivi, who succeeded Mannerheim as President, also claimed that Mannerheim was so old that he could not always control his mood swings. On the other hand, it can be argued that Mannerheim excelled in politics. Even though he was a soldier, and was not supposed to take part in politics, Mannerheim could not help but be a highly political figure. A vital question during the war was when to make peace with the Soviet Union. Too early would mean that Germany would be in a position to retaliate. Too late risked Soviet occupation of Finland. 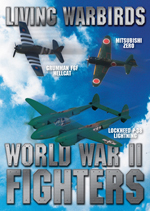 From 1942, it became increasingly clear that Germany would not win the war against the Soviet Union. Mannerheim was kept, as it were, in reserve, in order to potentially take the leadership of the nation and lead it to peace. Mannerheim played this role skilfully; he had a clear vision of how Finland should conduct its war in the sensitive situation when the war's ultimate end was unclear. He knew how to treat the Germans to secure as much military support as possible without involving Finland in any binding treaties. For instance, during the build-up for the Continuation War in 1941, Mannerheim was offered command of all German forces on Finnish soil. While such an arrangement could have made prosecuting the war easier, Mannerheim recognized that this would mean subordinating himself to Hitler. As Mannerheim wanted at all costs to avoid this, he refused the offer. 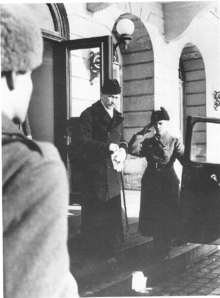 Picture - Mannerheim leaves the President's Residence in Helsinki on 4 March 1946 after his short presidency. 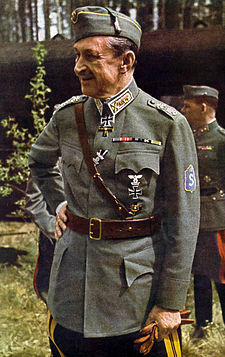 In June 1944, Gustaf Mannerheim, to ensure German support while a major Soviet offensive was threatening Finland, thought it necessary to agree to the pact the German Foreign Minister Joachim von Ribbentrop demanded. But even then Mannerheim managed to distance himself from the pact and it fell to President Risto Ryti to sign it, so that came to be known as the Ryti-Ribbentrop Agreement. This allowed Mannerheim to revoke the agreement with the resignation of President Ryti at the start of August 1944. Mannerheim succeeded him as president. When Germany was deemed sufficiently weakened, and the USSR's summer offensive was fought to a standstill (see Battle of Tali-Ihantala) (thanks to the June agreement with the Germans), Finland's leaders saw a chance to reach a peace with the Soviet Union. It became clear that Mannerheim was the only person who had sufficient prestige, both internationally and domestically, to extricate Finland from the war. He enjoyed the confidence of a majority of the Finnish people, and was effectively the only one with the authority necessary to guide Finland in the transition from war to peace. At first, attempts were made to persuade Mannerheim to become prime minister, but he rejected this because of his age and lack of experience in the running of a civil government. The next suggestion was to elect him Head of State. Risto Ryti would resign as President, and parliament would elect Mannerheim as Regent. The use of the title "Regent" would have reflected the exceptional circumstances of his election. Mannerheim and Ryti both agreed, and Ryti resigned as president on 1 August, giving as reasons his health and the necessity of combining civil and military authority in one person at that moment. Mannerheim decided that he wished to be elected president to avoid any misconceptions about the nature of his office. Due to the difficult conditions, general elections could not be held, and the Parliament elected Mannerheim as President of the Republic of Finland on 4 August 1944. He took the oath of office the same day. Mr Speaker, I wish to express my heartfelt thanks for the kind words that you spoke about me. Honourable members of parliament, in accepting for the second time, at this difficult moment of national destiny, the duties of head of state, I do so deeply aware of the responsibilities placed upon me. Great are the difficulties that we will have to overcome in order to safeguard our future. Foremost in my mind at this moment is the army of Finland, now in its fifth year of battle. Trusting the Almighty, I hope and I believe that, with the support of the parliament and the government and having an unanimous people behind us, we will succeed in preserving our independence and the existence of our nation. A month after he took office, the Continuation War was concluded on harsh terms, but ultimately far less harsh than those imposed on the other states bordering the Soviet Union. Finland retained its sovereignty, its parliamentary democracy and market economy. Territorial losses were considerable, all Karelia and Petsamo were lost. Numerous Karelian refugees needed to be relocated. 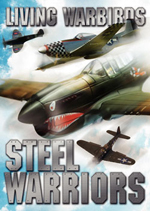 The war reparations were very heavy. Finland also had to fight the Lapland War against withdrawing German troops in the north, and at the same time demobilize its own army. It is widely agreed that only Mannerheim could have guided Finland through these difficult times, when the Finnish people had to come to terms with the severe conditions of the armistice, their implementation by a Soviet-dominated Allied Control Commission, and the task of post-war reconstruction. Mannerheim's term as president was difficult for him. Although he was elected for a full six-year term, he was in his late seventies, and had accepted the office reluctantly after being urged to do so. The situation was exacerbated by frequent periods of ill-health, the demands of the Allied Control Commission, and the war responsibility trials. He was afraid throughout most of his presidency that the commission would request that he be prosecuted for crimes against peace. This never happened. One of the reasons to this was Stalin's respect for and admiration of the Marshal. Stalin told a Finnish delegation in Moscow in 1947 that the Finns owe much to their old Marshal. Due to him Finland was not occupied. Despite Mannerheim's criticisms of some of the demands of the Control Commission, Mannerheim worked hard to carry out Finland's armistice obligations. He also emphasised the necessity of further work on reconstruction in Finland after the war. Mannerheim had to learn more about parliamentarism, which he could not fully respect before, due to his aristocratic views. He even reluctantly appointed Finland's first Communist Cabinet ministers. Mannerheim was troubled by recurring health problems during 1945, and was absent on medical leave from his duties as president from November until February 1946. He spent six weeks in Portugal to restore his health. After the announcement of the verdicts in the war crimes trials were announced in February, Mannerheim decided to resign. He believed that he had accomplished the duties he had been elected to carry out: The war was ended, the armistice obligations carried out, and the war crimes trial finished. Mannerheim resigned as president on 4 March 1946, giving as his reason his declining health and his view that the tasks he had been elected to carry out had been accomplished. Even the Finnish communists, his enemies in 1918, appreciated his efforts and his role in maintaining the unity of the country during a difficult period. He was succeeded by his conservative Prime Minister Juho Kusti Paasikivi. 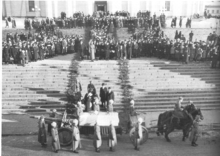 Picture - Mannerheim's funeral parade in Helsinki Senate Square in 4th February 1951. After his resignation, Mannerheim bought Kirkniemi Manor in Lohja, intending to spend his retirement there. In June 1946, he was operated for a perforated peptic ulcer, and in October of that year he was diagnosed with a duodenal ulcer. In early 1947, it was recommended that he should travel to the Valmont Sanatorium in Montreux, Switzerland, to recuperate and write his memoirs. Valmont was to be Mannerheim's main residence for the remainder of his life, although he regularly returned to Finland, and also visited Sweden, France and Italy. Because Mannerheim was old and sickly, he personally wrote only certain passages of his memoirs; some other parts he dictated and described, and the remaining parts were written by his various assistants, such as Colonel Aladx�r Paasonen, General Erik Heinrichs, other Generals Grandell, Olenius and Martola, and Colonel Viljanen, who was also a war historian. As long as Mannerheim was able to read, he proofread the typewritten drafts of his memoirs. He was almost totally quiet about his private life, and focused instead on Finland's events - especially on those between 1917 and 1944. When Mannerheim had a fatal stomach attack in January 1951, his memoirs were not yet in their finished form. They were published after his death. Picture - A ceremony commemorating the anniversary of the start of the Winter War (1939) at the Mannerheim statue in Helsinki. Carl Gustaf Emil Mannerheim died on 27 January 1951 (which was already 28 January in Finland) in the Cantonal Hospital in Lausanne, Switzerland. He was buried on 4 February 1951 in the Hietaniemi Cemetery in Helsinki in a state funeral with full military honours, and today retains respect as Finland's greatest statesman. This may be partly due to his refusal to enter partisan politics, although his sympathies were more right-wing than left-wing, his claim to always serve the fatherland without selfish motives, his personal courage in visiting the frontlines, his ability to work diligently into his late seventies, and his foreign political farsightedness in preparing for the Soviet invasion of Finland years before it occurred (see, for example, Jx�gerskix�ld, "Mannerheim 1867-1951";"The Republic's Presidents 1940-1956" / Tasavallan presidentit 1940-1956, published in Finland in 1993-94). Mannerheim's birthday, the fourth of June, is celebrated as the Flag Day of the Finnish Defence Forces. This decision was made by the Finnish government on the occasion of his 75th birthday in 1942, when he was also granted the title of Marshal of Finland. The flag day is celebrated with a national parade, and rewards and promotions for members of the defence forces. The life and times of Mannerheim are depicted in the Mannerheim Museum. Marshal Carl Gustaf Emil Mannerheim was selected as the main motif in a recent Finnish commemorative coin, the €10 Mannerheim and Saint Petersburg commemorative coin, minted in 2003. The obverse of the coin features a portrait of the Marshal. 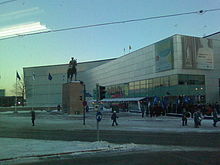 On 5 December 2004, Mannerheim was voted as the greatest Finnish person of all time in the Suuret suomalaiset (Great Finns) contest. A biographical film about Mannerheim's life is currently (2009) under way, directed by Renny Harlin. Mannerheim was Commander-in-Chief of the White Guard from January to May 1918. He was also Commander-in-Chief of the Finnish Defence Forces from December 1918 to July 1919, and from 1939 to 1946. He was Chairman of the Defence Council from 1931 to 1939. In the course of his lifetime, Mannerheim received 82 military and civilian decorations. Order of the Rising Sun with Paulownia Flowers, Grand Cordon (Japan).